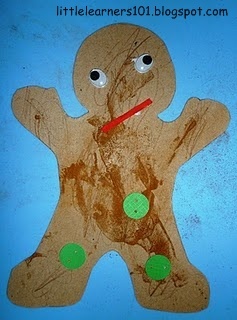 Gingerbread cutout. I folded a piece of paper in half and drew the picture that I wanted, then cut it out and traced it onto a cereal box. Powdered Ginger - I used cinnamon because I ran out of ginger making the cookies. Buttons - can use real buttons. I used some card cut with a circle punch, then punched 2 tiny holes in it to make the holes in the buttons. R chose the colour of the button. A piece of red paper (I used quilling paper) for the mouth. 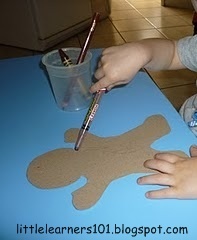 ﻿First, I gave R the pencils and crayons on brown and he drew on the cutout. This didn't last long, because he really wanted to get to the glue. 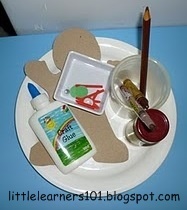 Then he used the glue to cover the gingerbread man cutout. Followed by shaking the cinnamon (or ginger if you have it) onto the "man" as he was called by R. The holes in my cinnamon shaker were a bit too big and the cinnamon came out really fast. 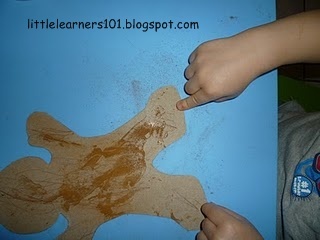 Shake the man to spread the cinnamon over the glue. Lastly, R glued again. I gave the directions to put the eyes and mouth on his head, and the buttons on his body. R chose where to place them. R loved the 'man' and talked about him for many days.